Polyether Ether Ketone (PEEK) is one of the renowned high performance polymers extensively incorporated across several industries such as automotive, aerospace, oil and gas, and healthcare, among others. With its incomparable mechanical properties and resistance to chemicals, fatigue, and creep, among others, PEEK has been significantly aiding in dealing with difficulties pertaining to weight reduction, system downsizing, and performance, among others. Apart from weight reduction and enhanced performance, the incorporation of PEEK also helps in design optimization and system cost reduction. One of the pivotal advantages of PEEK includes dimensional stability and shape memory at high operating temperatures. Owing to its biocompatible properties and stiffness in congruence with bone structure, PEEK is the best suitable material for fabrication and development of medical implants. The successful incorporation of PEEK material for the development of medical implants, has significantly enhanced the scope of PEEK material for non-implant medical applications. Acknowledging the massive potential of PEEK material for non-implant medical applications, several companies such as Victrex plc, Evonik Industries AG, and Solvay S.A., among others, have made significant investments to unleash the potential of the market. The North America PEEK material market is the second largest in terms of revenue and consumption of PEEK. The North America PEEK material market has been witnessing a stable and promising compound annual growth rate of approximately 2.00% since the past three years (2014-2017). Regardless of its exorbitant cost, PEEK has gained momentous acceptance across several industries such as automobile, aerospace, consumer electronics, oil and gas, manufacturing, and healthcare, among others. Some of the applications in which PEEK material is incorporated to a considerable extent are engine piston parts, high-performance liquid chromatography columns, bearings, electrical cable insulation, pumps, and compressor plate valves, among others. Specific to the healthcare industry, the features such as durability, biocompatibility, and excellent resistance to extreme sterilization techniques, among others, make PEEK the best suitable material for certain pivotal applications, such as surgical equipment, spinal implants, orthopaedic implants, and dental equipment, among others. Further, PEEK is the only known material which can be incorporated in ultra-high vacuum applications. Owing to the aforementioned elite features, PEEK material is significantly incorporated in the fabrication of active implantable devices. The purpose of the study is to gain a holistic view of the North America PEEK material market in terms of various factors influencing it such as recent trends and technological advancements. The market has been segmented into ‘application’, ‘type’, ’forms’ and ‘country’. It also evaluates the opportunities in the market for stakeholders and provide details of the competitive landscape for market leaders. Moreover, the study also includes exhaustive information on the product shortcomings, unmet needs, perception on the new products, consumer preferences, competitive landscape, restraints and opportunities, and the other vital information with respect to the North America PEEK material market. Further, the report also presents a detailed analysis of the market dynamics, pricing trends, and the estimation of the market size over the forecast period 2018-2025. The report presents the reader with an opportunity to unlock comprehensive insights with respect to the market and helps in forming well-informed strategic decisions. The research uncovers some of the substantial parameters that must be taken into consideration before entering the market. 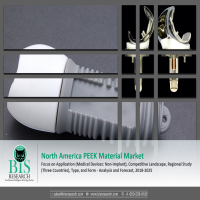 This research report aims at answering various aspects of the North America PEEK material market with the help of the key factors driving the market, restraints and challenges that can possibly inhibit the overall market growth, and the current growth opportunities that are going to shape the future trajectory of the market expansion. The report includes an in-depth examination of the key players and recent developments taking place in this market. Moreover, the report includes chapters on market dynamics (market drivers, opportunities, and challenges) and industry analysis as well. • What are the key features that are promoting PEEK material’s incorporation in different applications? • What are the key applications of PEEK material across different fields such as aerospace, automotive, electronics, and healthcare? • What are the major market drivers, challenges, and opportunities in the North America PEEK material market? • What is the scale of PEEK material consumption across countries namely the U.S., Canada, and Mexico? • What is the current production capacity of key players of the market? • What is future scope of expansion of production capacities of key players of the market? • Who are the key consumers of PEEK material across several industries such as aerospace, automotive, electronics, and healthcare? • What are the key developmental strategies that are implemented by the key players to sustain this market? • What are the leading companies dominating the North America PEEK material market? • What is the scale of impact on market dynamics by the operations of key players of the North America PEEK material market? • What are the leading companies dominating the North America medical grade PEEK material market? • What are the fields which are anticipated to witness impressive growth rate in terms of PEEK material incorporation? • What are investors’ perceptions about the North America PEEK material market? • What are the regulations pertaining to the incorporation of PEEK material in North America? • What is the scale of investment for research and development by key companies of the market? • What are the key areas focused by leading players of the market for the expansion and strengthening of PEEK material product portfolio? • What are the benefits of the incorporation of PEEK material in comparison with other high performance polymers? • What was the market value of the leading segments and sub-segments of the North America PEEK material market in 2017? • How will each segment of the North America PEEK material market grow during the forecast period, and what will be the revenue generated by each of the segments by the end of 2025? • How will the industry evolve during the forecast period 2018-2025? • Which geographical location will contribute to the highest sales of the PEEK material during the forecast period? The key players who have been contributing significantly to the North America PEEK material market are Akro-Plastic GmbH, Apollo Medical Extrusion Technologies, Boedeker Plastics, Inc., Cadence Inc., Celanese Corporation, Centroplast Engineering Plastics GmbH, CoorsTek Medical LLC, Drake Plastics Ltd., Emco Industrial Plastics, Inc., Ensinger Holding Gmbh & Co. Kg, Evonik Industries AG, Goodfellow Cambridge Ltd., Greene, Tweed & Co., Inc., Omnia Plastica SpA, Parker-Hannifin Corporation, Quantum Polymers Corporation, R & B Plastics, Inc., RTP Company, SABIC, Sentinel Plastics Limited, Solvay S.A., Victrex plc, and Zell-Metall Ges.m.b.H. Engineering Plastics, among others. 12.9 Emco Industrial Plastics, Inc.
12.13 Greene, Tweed & Co., Inc.
12.18 R & B Plastics, Inc. The everlasting aim to maximize power-to-weight ratio and persistent rise in the desired performance levels of mechanical systems are the key factors which promoted the development of high-performance materials. Further, the resolute aim to nullify dependency on fossil fuels and a rise in the regulatory pressure aimed at slashing the scale of Cox emissions have significantly elevated the requirement of congruous alternative for metals and their alloys. The technological advancements in the field of composites and material sciences have resulted in the development of high performance polymer solutions such as Polyether Ether Ketone (PEEK), Polyether Sulfone (PES), Polyvinylidene Fluoride (PVDF), and Liquid Crystal Polymers (LCP), among others. The incorporation of high performance polymers has significantly helped companies across several industries to deal with issues pertaining to system downsizing, weight reduction, performance maximization, and regulatory compliance, among others. The massive-scale incorporation of high performance materials into the automotive and aerospace industries has considerably expanded the scope of applications of high performance materials in several other industries such as oil and gas, consumer electronics, manufacturing, and healthcare and medical. Polyether Ether Ketone (PEEK) is one of the distinguished high-performance polymers with several elite features such as enhanced mechanical strength, fatigue resistance, resistance to creep, biocompatibility, chemical resistance, resistance to radiation, and dimensional stability, among others. The material’s dimensional stability, shape memory ability, enhanced mechanical properties, and compatibility in high temperature ecosystems, among others, have resulted in massive-scale incorporation of the material in several applications of aerospace and automotive industry. The successful incorporation of PEEK material in aerospace and automotive industries has significantly enhanced the scope of application of PEEK material across several other industries such as oil and gas, manufacturing, and healthcare, among others. The biocompatible properties of the PEEK material such as naturally translucent, high chemical resistance, remarkable inertness, strength and stiffness in congruence with bone structure, stability at high temperatures, and exceptional wear and abrasive resistance, among others, have made it an ideal material for fabrication of implants and active implantable devices. The purpose of the study is to gain a holistic view of the North America PEEK material market in terms of various factors influencing it such as recent trends and technological advancements. The scope of this report is centered upon conducting a detailed study of different applications of PEEK across several industries, different types of compounded compositions available, and different types of PEEK product forms available. The market has been segmented into ‘application’, ‘type’, ’forms’ and ‘country’. The market value was estimated using these four different approaches and was validated with one another. These segments are further divided into several sub-segments to ease the process of market estimation and to gain a holistic view of the market. The North America PEEK material market is anticipated to reach $335.8 million by 2025, registering a CAGR of 8.36% during the forecast period 2018-2025. The massive demand for PEEK material from consumer electronics and medical implants industry is the prominent factor promoting the growth of the North America PEEK material market. The glass-based PEEK compounded resins are the leading contributors for the growth of the North America PEEK compounded resin market. In 2017, the contribution of glass-based PEEK compounded resins valued $48.6 million. However, the PTFE-based PEEK compounded resins are anticipated to witness the highest CAGR of 10.82% in the forecast period 2018-2025. The rising demand for materials with low-coefficient of friction which are aimed at optimizing performance, is the leading factor propelling the growth of PTFE-based PEEK compounded resins market. Currently, the powder form of PEEK is the leading contributor to the North America PEEK material market. In 2017, the contribution of powder form of PEEK was valued $56.5 million. Medical grade PEEK products are currently the leading contributors to the North America PEEK material market. The market for the medical grade PEEK products are anticipated to witness a nominal growth rate of 5.88% annually in the forecast period 2018-2025. The Canada PEEK material market is anticipated to witness the highest CAGR of 10.07% in the forecast period 2018-2025.